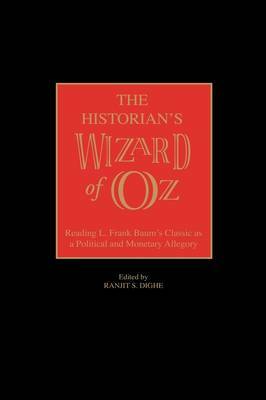 The Historian's Wizard of Oz synthesizes four decades of scholarly interpretations of L. Frank Baum's classic children's novel as an allegory of the Gilded Age political economy and a comment on the gold standard. The heart of the book is an annotated version of The Wizard of Oz that highlights the possible political and monetary symbolism in the book by relating characters, settings, and incidents in it to the historical events and figures of the 1890s, the decade in which Baum wrote his story. Dighe simultaneously values the leading political interpretations of Oz as useful and creative teaching tools, and consolidates them in a sympathetic fashion; yet he rejects the commonly held, and by now well-debunked, view that those interpretations reflect Baum's likely motivations in writing the book. The result is a unique way for readers to acquaint themselves with a classic of children's literature that is a bit different and darker than the better-known film version. Students of history and economics will find two great stories: the dramatic rise and fall of monetary populism and William Jennings Bryan and the original rendering of a childhood story that they know and love. This study draws on several worthy versions of the Oz-as-Populist-parable thesis, but it also separates the reading of Baum's book in this manner from Baum's original intentions. Despite an incongruence with Baum's intent, reading the story as a parable continues to provide a remarkable window into the historical events of the 1890s and, thus, constitutes a tremendous teaching tool for historians, economists, and political scientists. Dighe also includes a primer on gold, silver, and the American monetary system, as well as a brief history of the Populist movement.